It is produced exclusively with Aglio di Voghiera DOP. 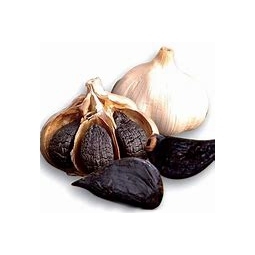 Unmistakable for its elastic consistency and much softer than traditional garlic. It has a sweet and delicate taste. An extraordinary 100% Italian superfood. Procedure: Prepare the vegetable stock. We recommend making a delicate and clear broth, made with leek, carrots, courgettes and celery. Add to the stock still warm, the black garlic for 3-5 minutes depending on the size. After the time has elapsed, remove the cloves and insert them in a mixer. Activate the blender and add the broth flush until the desired consistency is reached. Finally, season with a drizzle of extra virgin olive oil.